Kids’ enamel is thinner and softer than older people, making them vulnerable to tooth decay. This puts every child at risk of tooth decay. The bacteria in the mouth feed on sugars from foods and drinks. Children are obviously not born with tooth cavities, they either get it from an adults’ saliva or because of the junk they eat. Tooth decay in children affects them at a young age. Tooth decay in toddlers and babies are often referred to as ‘baby bottle tooth decay’ or ‘early childhood carries’. It mainly occurs in the upper front teeth and then spreads to the gum line. Also read: Is it necessary to sanitize your toothbrush? 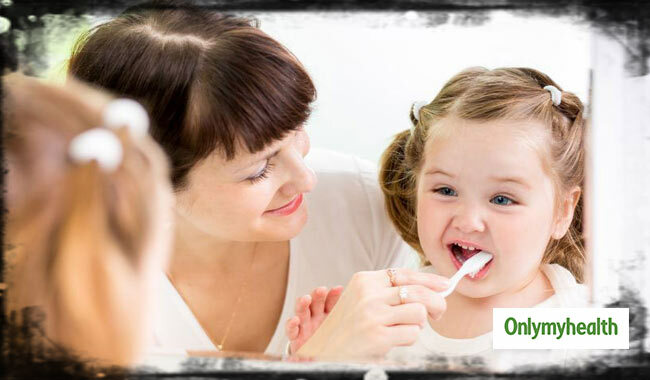 Tooth decay begins when the cavity-causing bacteria are passed from the mother to the infant through her saliva, as the mother puts the baby’s feeding spoon in her mouth. Prolonged exposure to sweet foods, such as chocolate, sugary snacks and drinks is another cause of the disease. This disease may hurt the toddler, thus causing a lot of discomforts. Tooth decay is quite painless at the early stages. Initially, it appears as cavities in the upper four teeth of the toddler. This indicates the presence of cavities elsewhere in the mouth as well. If it goes unnoticed, it might eventually lead to pain in the mouth of the toddler. This pain is caused mainly due to a continuous consumption of sweet foods such as sugary snacks, chocolates, candies, and sweetened drinks. The cavities can spread to other teeth as well. They start appearing near the gum line and turn them dark brown. With the increasing problem of tooth decay, the patient’s teeth become more sensitive to hot and cold drinks, thus indicating that the nerves and blood vessels in the tooth have been affected by this decay. Dental caries is usually diagnosed on the basis of the complete history and physical examination of the child. In order to prevent tooth decay in toddlers, one should take certain steps. Avoiding a continuous use of sippy cups and bottles conditions the growth of bacteria, especially, if it contains juice or milk. The bacteria convert the dietary sugar into acid. When this acid comes in contact with the baby’s teeth, it dissolves the tooth structure and the decay progresses. Thus, the baby should not be allowed to sleep with a bottle containing these drinks, but only water. Therefore, it is considered safest to give plain water to the baby in between meals rather than feeding a sweet liquid. Along with brushing the teeth twice a day and rinsing the mouth after every meal, one may opt for flossing with fluoride toothpaste. In case a cavity is formed, a filling procedure may be followed to fill the cavity, thus restoring it to its original shape after the decaying portion has been removed. If the tooth is badly damaged, capping with a crown (also known as a cap) may be done. This is done when filling the teeth does not help in the restoration of the original shape and structure of the tooth. Again, if the pulp of the tooth is affected, a root canal treatment can be opted for. In some unfortunate cases, symptoms of tooth decay in toddlers become so severe that the teeth cannot be repaired and need to be removed. The good news is that decay is preventable if symptoms are identified and treated at the right time. How does one Prevent Postpartum Depression?